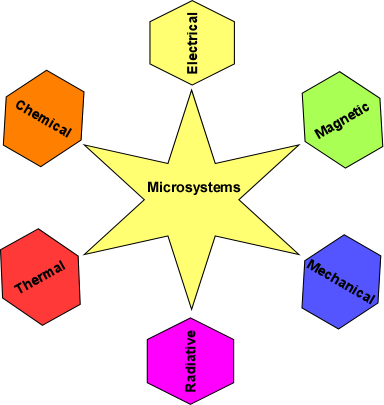 The course will introduce the students to MEMS-based microsystems, with an emphasis on an integrated perspective and systematic methods for the design and analysis of interdisciplinary systems at microscale. A structured top-down design methodology encompassing several levels (symbolic computation based on analytical modeling, reduced order macromodeling, finite element analysis and layout design) will be applied to design projects and case studies in the field of MEMS (micro-electromechanical systems). Available design and analysis tools (matlab/Simulink, MEMS Pro and Comsol Multiphysics) will be used during the project assignments. The course will also introduce standard behavioral modeling languages (VHDL-AMS, Modelica) used in current simulators. Structured design practices in Microsystems; unified schematic representations across multiple energy domains; from physical limitations in MEMS to their interface with electronics; apply multiphysics design techniques to projects and case studies; introduction to behavioral modeling languages for mixed analog-digital system design. None. The course is offered to graduate students from various disciplines of Engineering and Applied Science, where the problem of designing interdisciplinary systems at microscale is expected to achieve a key role. An introductory knowledge of MEMS (e.g. as presented in EECE402) is helpful but not required. Lecture notes and articles will be provided in the classroom. Available e-books through UBC library portal (e.g., [1,2,3] in the books list ) will be indicated to students. Additional information sources are listed below.